Samsung has announced that 2018 and 2019 Smart TVs will offer Apple iTunes Movies and TV Show support, along with support for Apple’s AirPlay 2. The surprise announcement made today has wider implications to Apple’s content service as well as future plans for the Apple TV hardware. 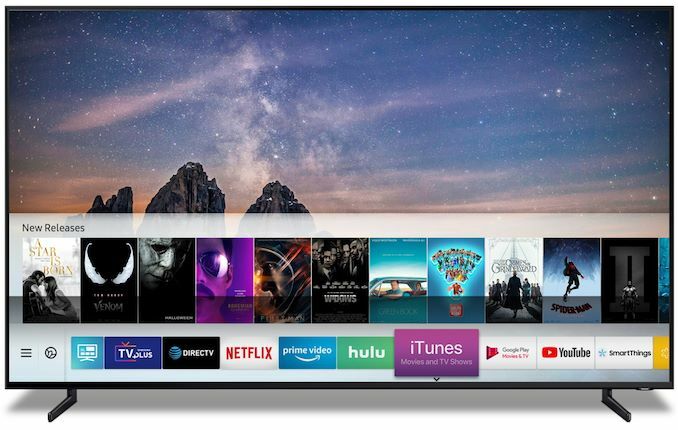 The new “iTunes Movies and TV Shows” Smart TV application will be available on all new 2019 TV models from Samsung beginning this spring, as well as seeing support for 2018 models via firmware updates. The adoption of the iTunes library of movies and TV shows gives Samsung TV users a new content delivery source, but most importantly, it gives Apple unprecedented access to a userbase of potential new customers for its service. This also represents the first time that Apple will allow access to its service from a non-Apple/non-iTunes device, essentially bypassing the need for a customer to buy Apple hardware such as the Apple TV. There are still some open and unanswered technical questions on how the implementation will work – for example the fact that Samsung TVs do not support Dolby Vision is certainly an aspect that will in some way or other affect the way HDR content will be delivered and played back. Given that the announcement is made by press release by Samsung, it seems that the deal has some sort exclusivity – leaving out other Smart TV vendors for the time being.